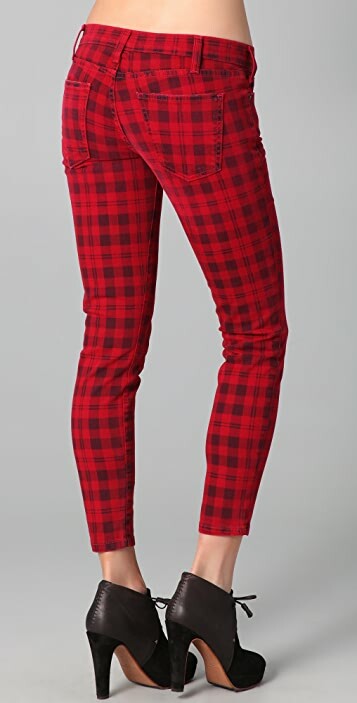 These plaid ankle skinny jeans feature 5-pocket styling and a single-button closure. Worn edges. 10" leg opening. * 8" rise. 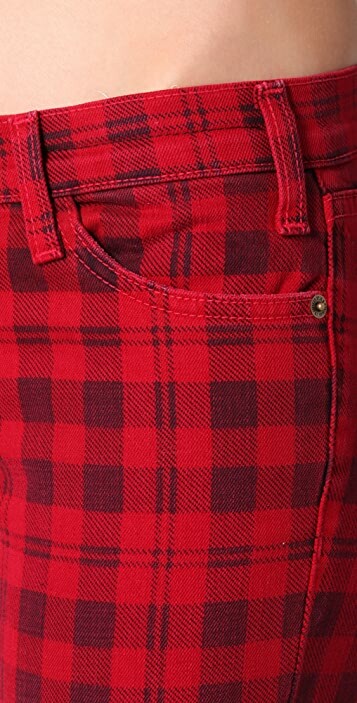 27" inseam. I love these. They are lightweight and comfy, but run very big. I am usually a 27, but the 26 was still a little big on me. Otherwise, 5 stars. I love these jeans. Im 5'7 117lbs. I ordered a size 26 and the fit is perfect. I would however warn anyone with extra flesh in the adomen area to stay away these to avoid an unsightly muffin top. And.... I wouldnt recommend these to ladies with athletic calves or thighs. Although they look black and red in the picture... the black is faded and can pass for blue. I gave these 5 stars because they work for me personally. Grorgeous pants, a little big though and I expected the quality to be a little better. I think I found my new favorite CE cut. It's a slimmer fit than the Skinny and it's cropped so for shorties like me it's ready to wear. 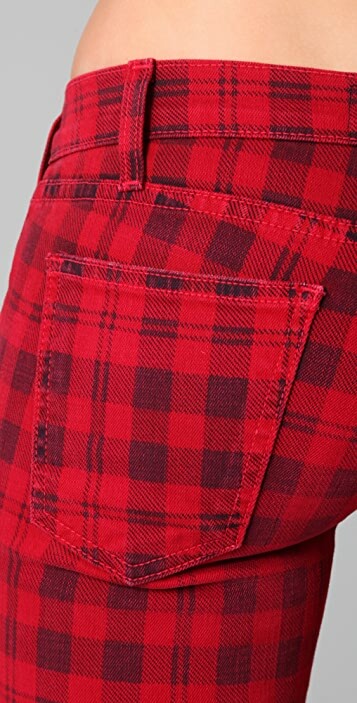 The fabric is a light-to-medium weight denim. The plaid is only printed on the outside and might fade with washing but oh well. I wore it out the door the day I got them. They fit like CE usually does which for me means a size down from what I normally order. Love them! I love the color/pattern of these. I've bought CE in the past with no problems. But, these don't fit right. They are low-riders with very little give for hips and runner's thighs. They fit but a little too snug. I didn't send them back though; I made it work. I just recommend a shirt that skims the hips unless you want to show some abs. I have become a big fan of C&E. They keep bringing different & unusual patterned jeans & I love them all. 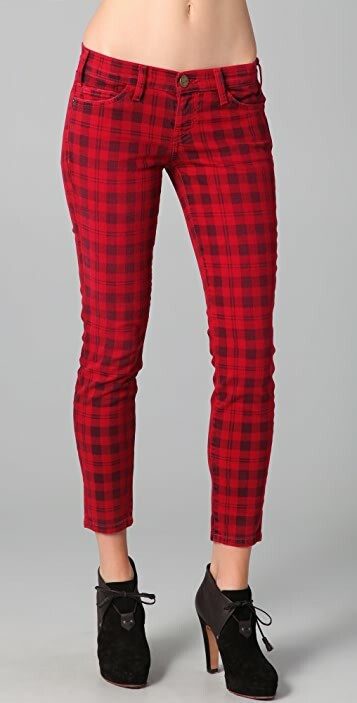 Have these tartan jeans & they are quite versatile, goes with alot more than just black tops. I need not mention the fit....anyone who knows C&E will agree they are always PERFECT.